In this Jan. 28, 2015, file photo, state Rep. Ron Travis asks Gov. Bill Haslam a question about his Insure Tennessee plan which could expand Medicare to thousands of people in the state of Tennessee. Gov. Haslam spoke while visiting the Cherokee Health Systems office in downtown Chattanooga. NASHVILLE — A successful marriage bill evidently requires a good amendment to pass when it comes to the Tennessee House. That was certainly the case Thursday for Rep. Ron Travis, R-Dayton, who just last week saw his bill to allow members of the General Assembly to solemnize marriages flounder amid questions and concerns voiced by colleagues. A week later and a new amendment crafted by Rep. Mike Carter, R-Ooltewah, helped the bill pick up steam. Under the amendment, current and former legislators would have to opt into the would-be law’s provisions in order to perform the ceremonies. To do so, a legislator would have to file notice of his or her intention to solemnize the rite of matrimony with the Office of Vital Records. After Travis explained the amendment and it was adopted, House Bill 213 flew through on a 70-16 vote with no debate. The bill also says “persons receiving online ordinations may not solemnize the rite of matrimony” in the future. In addition to current and former legislators, the bill also adds to the already lengthy list of existing officials authorized to preside over a marriage, including Tennessee’s nearly 1,700 city or town council members, as well as police chaplains “duly appointed” by state or local law enforcement leaders. 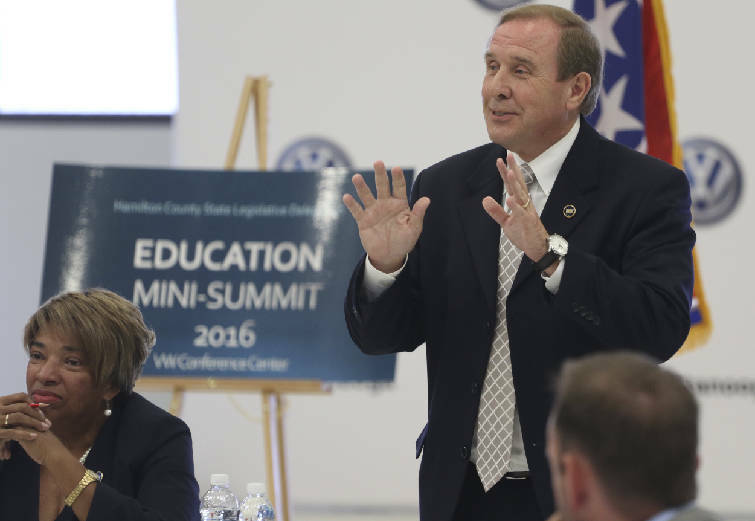 State Rep. Mike Carter speaks during a 2016 education forum at the Volkswagen Conference Center. Under the bill, that “clarification” would ban persons receiving online ordinations from solemnizing a marriage. The bill also declares that any marriage entered into prior to July 1 would not be affected. The bill retains current law that says a minister, preacher, pastor, priest, rabbi or other spiritual leader who must be ordained or “otherwise designated in conformity with the customs of a church, temple or other religious group or organization” is authorized to perform the ceremony. And it doesn’t affect the huge list of current and former government officials who can preside over marriages. That includes the governor, the current and former speakers of the state House and Senate, current and retired judges, current and former county and city mayors, the county clerks who issue marriage licenses and county commissioners in the state’s 95 counties. Last week, a number of legislators raised concerns about being included. Some were worried about getting deluged with requests. Travis sought to assure Weaver the bill was permissive and it was up to her whether to perform a marriage ceremony or not. At that point, Travis realized there were problems and delayed the bill until Thursday to resolve concerns. Sen. Ken Yager, R-Kingston, is carrying the companion bill, Senate Bill 1377, in the upper chamber. It has been set for the final meeting this year of the Senate Judiciary Committee.